Siren Nation celebrates 9 years! From Rachel Mann to a Kate Bush tribute to the Famous Haydell Sisters and the Libertine Belles (pictured)...plus lots more. As a founding board member of Siren Nation - the annual festival and presenting arts organization that serves to create performance and exhibition opportunities to showcase the original work of women in music, film, performance, fashion, comedy and visual art throughout the year – it is an annual celebration of female artists and creativity that is near and dear to my heart. This year, the festival takes place between November 4 – 15. In addition to the music events below, the festival features a comedy night “Hell Hath No Funny” on November 4th, a group art show “Paths to the Pacific Northwest” featuring 40 women artists on November 5th, a live storytelling event “The Broadcast” on November 11th and favorites the Siren Nation Art & Craft Sale and Free Workshops at The McMenamin’s Kennedy School on November 15th. All the events are sure to be a hit, but given the success of Kate Bush’s sold out performances this year, you’d better get your tickets to Siren Nation Festival’s Cloudbusting event on November 8th in advance as the evening is dedicated to one of pop music's most enchanting and uncompromising stars with a cast of Portland's most talented female musicians taking on Bush's catalog. Erin McKeown is a musician, writer, and producer known internationally for her prolific disregard of stylistic boundaries. Her brash and clever electric guitar playing is something to see. Her singing voice is truly unique – clear, cool, and collected. Over the course of 7 studio albums and thousands of live performances, Erin has developed and refined a distinct and challenging mix of American musical styles. Doors at 7:30PM. Show at 8PM. Step back in time and into a Speakeasy where you can drink, dance and enjoy live variety entertainment & classic burlesque all to the live music of Pink Lady & John Bennett Jazz Band! Featuring: Zora Von Pavonine, Mae Zing, Pink Lady DiAnn, Portland Rhythm Shakers. Additional cast: Zora Von Pavonine, Pink Lady DiAnn and more! 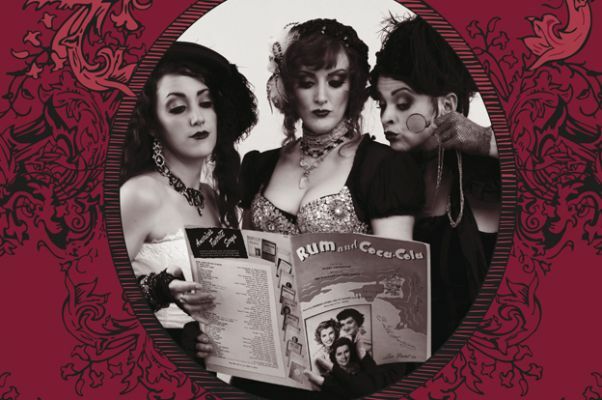 The Libertine Belles are a female vocal swing trio based in Portland Oregon. Our set lists include vintage jazz music and original songs that conjure up Tin Pan Alley! Rachel Mann has brought a special blend of country & folk with her on her recent arrival on the Portland music scene. Making waves as a new voice not to be missed, she will delight listeners with her original tunes as well as covers of some tried and true favorites. She looks forward to sharing the stage with some of her favorite musicians for this exciting show! 8:30pm show. $8 adv. / $10 Door. Tuesday, November 10: The Doubleclicks, Jackie Kashian and Molley Lewis. Doors: 7:30 pm / Show: 8:00 pm. $10.00 – $12.00 – 21+ only. At Rialto Corner Bar. 401 SW Alder St. The Famous Haydell Sisters Comeback Tour is a musical comedy routine featuring sisters Maybelle (Sadie Bowman) and Mattie (Donna Kay Yarborough) as a pair of 1990s child stars who are making a comeback 20 years after their last concert. Doors at 7:30, music at 8PM. $12.00 advance $14.00 day of show. Micachu and the Shapes’ Mica Levi earned acclaimed for the score for the sci-fi thriller Under the Skin. This year, she’s back with the band for the follow-up to 2012’s Never. Good Sad Happy Bad is out September 11 via Rough Trade. Doors: 8:00 pm / Show: 9:00 pm. $12.00. 21+ only. TOPS form precious balances. They create emotionally powerful sonic experiences with a contemporary understanding of the classic song structures that have guided pop music since the beginning. A close listen will reveal their assurance as musicians, but their experience derives from playing in warehouse lofts rather than going to school. There is a place for each note in their songs. Complexity disappears behind a veil of familiarity. Saturday, November 14: DJ Anjali w/ the incredible Kid. A Desi-Latino Soundclash: Take the sultry vibe of the Latin American Tropics, combine with the rhythm of India (“Taal”) and stir into Tropitaal – a Desi/Latino Soundclash where the hottest club sounds from India and Latin America go head to head in an all-night dance-off of epic proportions. Resident DJs Anjali & The Incredible Kid combine their deep passions and deep crates from across the spectrum of Caribbean, Indian and Latin vibes.